Good Luck to Ian Bostridge who is embarking on a recital tour of the USA. The tour kicked off last night in Berkeley, California and over the next two weeks Ian will appear in Vancouver (15 April), New York (17 April), Schenectady (19 April), Cleveland (21 April), Santa Barbara (23 April), Atlanta (25 April) and Princeton (27 April). 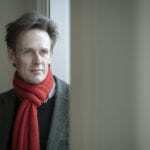 Click here to read a recent interview with Ian Bostridge about his latest book; “Schubert’s Winter Journey: An Anatomy of an Obsession”.